Even though it’s spring, I still love making soup. There’s nothing like a bowl of nourishing goodness to make a day better. And sometimes I don’t even heat the soup, but enjoy it room temperature or just barely warm. This spring soup is also very filling, which is great for slimming down those winter pounds. Roasting the celery and leeks makes this soup a snap to prepare and really elevates the fresh flavors. Serve with a slice of toasted bread or pita chips for a perfect spring lunch. Start by cleaning and slicing the stalks of celery into thin strips on the bias. Nice big thick slices, around 1/2-inch thick, is perfect. And don’t toss those celery leaves – you’ll need them later. Slice the leek in half, then into thin 1/4-inch half rings, and then rinse in a strainer to remove any icky grit. Coat a sheet pan with the vegetable oil and crank your oven to 425 F. While you’re waiting for things to heat up, chop the garlic and add to the sheet pan along with the celery and leeks. Sprinkle with the salt, dried oregano, and good dash of pepper. Place the veggies into the oven and set your timer for 15-minutes. While the celery, leeks and garlic are roasting, bring the chicken stock to a simmer and add the French green lentils and dry vermouth. Cover and let bubble while waiting for the veggies to roast. After about 10-minutes, turn the celery, leeks and garlic to prevent any burning. Allow them to continue roasting while the lentils simmer. You can do a taste test of the broth to check seasonings and adjust as desired with more salt, pepper, or oregano. 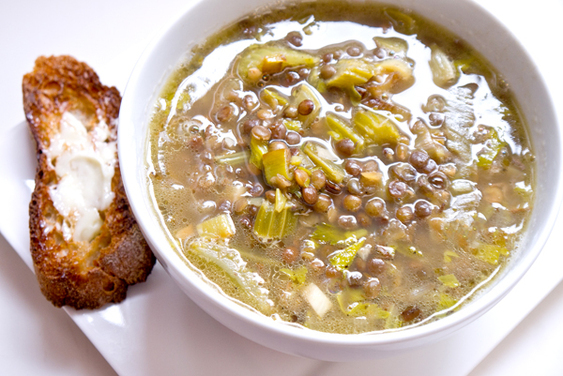 Remove the roasted celery, leeks, and garlic from the oven and add to the bubbling French green lentils. Chop up those celery leaves and add them, along with the 1-cup water, and simmer the soup uncovered for up to 20-minutes, or until the lentils are to your liking. Serve with toasted and buttered slices of good French bread.